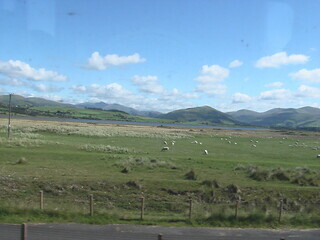 Fishguard & Goodwick station was opened on 14 May 2012, but is no longer the newest railway station in Wales. While it is undoubtedly nice to see continued investment in public transport, all three of the above are in the Cardiff area. The latter two are both on the Ebbw Vale line, which currently only has trains to Cardiff, and ‘Energlyn and Churchill Park’ is on the Rhymney Line of the Cardiff valleys network. The opening of Ebbw Vale Town represents the extension of the Ebbw Vale line, while the other two stations are on existing track. 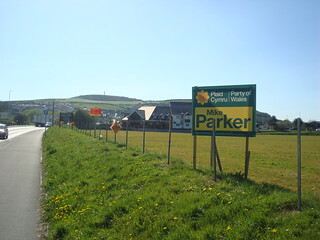 So, just like the UK as a whole, is the south-east of Wales getting more than its fair share of investment? Certainly, the Ebbw Vale line has an hourly service while the Fishguard branch has a 5 hour gap between trains in the afternoon. 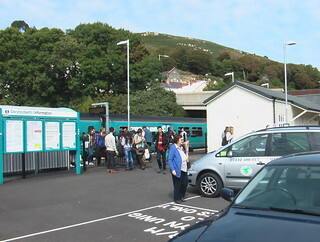 Granted, the population served by the Ebbw Vale line is much greater, so it warrants a more-frequent service than Fishguard, in fact Ebbw Vale could do with having an hourly service to Newport in addition to its current Cardiff service, but Fishguard’s 5hr gap (and near-total lack of Sunday trains) is a joke. I suppose the first phase of the Ebbw Vale line (Cardiff to Ebbw Vale Parkway), which opened in 2008, has the advantage that it got in first. By 2011, when Fishguard got its local trains back, the last of the class 150 units intended for the aborted ValleyLines train lengthening project was apparently used up. Surplus DMUs, available for introducing additional services, are now like hen’s teeth. At present then, new stations seem to be the ‘easy option’ for the government to show support for the railways, and on the suburban network arround Cardiff passengers are probably used to frequent stops. Adding additional calls into long-distance regional services would likely have more of an impact on the perceived journey times for existing services. I suppose it is not entirely fair to claim that Cardiff is getting all the investment. 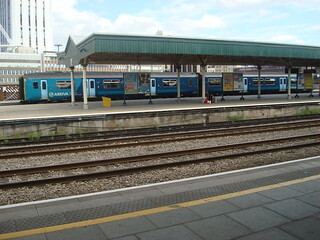 Sure, the Ebbw Vale service goes to Cardiff not Newport, and Wales’ second city (Swansea) has been completely left out of the ‘South-East Wales Metro’ proposals, but the Cambrian and Heart Of Wales lines have seen service improvements, introduced alongside Ebbw Vale Town Arriva Trains Wales’ May 2015 timetables. The Welsh Government appear to have asked Arriva Trains Wales to perform a minor miracle, service improvements with no additional trains to run them, and supprisingly Arriva seem to have delivered. Additional services to/from Aberystwyth have apparently been acheived by reducing the time available for maintainance of a class 158 unit at Machynlleth depot by a few hours, and by reducing one train in each direction from four carriages to two between Machynlleth and Shrewsbury. However, they have not been able to provide the full all-day hourly service that the Welsh Government once promised would be launched in 2011. 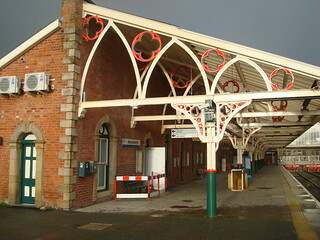 The Heart Of Wales Line (HOWL) has gained an additional weekday morning service, but not over the full length of the line. This appears to be primarily motiviated by the aim of providing an arrival in Swansea for 9am commuters, with the morning Pembroke/Fishguard train from Cardiff (two units which detach at Whitland) reduced to a single unit and the Fishguard service now starting at Swansea (and ommiting the call at Carmarthen) allowing that unit to work the new morning HOWL short-working (from Llandovery if I recall correctly) before going off to Fishguard. Perhaps the worst compromise is what has happened at the north end of the HOWL. I believe the commuter train into Shrewsbury now starts from Llandrindod rather than Swansea and this has had to be retimed to run earlier in order that HOWL services can interwork with the Crewe-Shrewsbury shuttle to resource the four full-length HOWL workings over the rest of the day. This has the commuters complaining they have to get up earlier. If these really are the only reductions made to facilitate this service I’m really quite impressed (except for that last one about Shrewsbury commuters) but I am concerned that the shortage of DMUs is a “butter scraped over too much bread” suituation. So, what do you think, is the south-east is getting all the pie? And can somebody find us some additional rolling stock, please?